Hammock straps are the least expensive of your hammock camping setup’s main components, but they deserve just as much attention as the rest of your gear. Having the right hammock straps can easily make the difference between a great weekend trip and an expletive-filled Twitter rant on Monday morning. In most cases, the latter scenario isn’t due to bad straps — it’s simply a result of buying the wrong type of straps. How do you choose the right hammock straps and avoid headaches on the trail? It starts with a basic understanding of the different types of straps at your disposal. Once you identify the type that’s best for you, it’s time to narrow down the field. Durability, quality, and reliability are obviously important, but so are objective factors like weight and length. Why are these last two factors objective? Because what’s best for you isn’t always what’s best for someone else. A car camper has the luxury of carrying the heaviest straps on the planet in the back of their car without breaking a sweat, while a backpacker gearing up for a 50 mile through-hike will want much lighter straps. 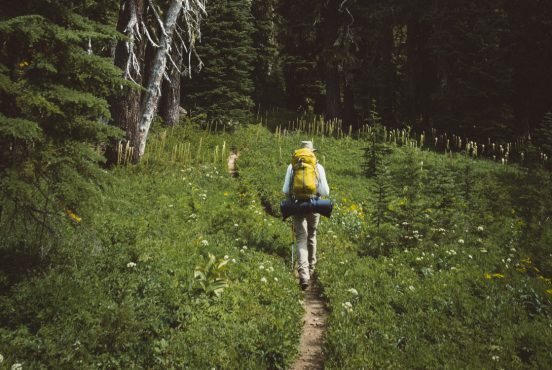 Similarly, someone who’s hanging a hammock in a dense forest with plenty of trees probably won’t need extra-long straps, while someone backpacking through an area with limited anchor points may need longer straps. 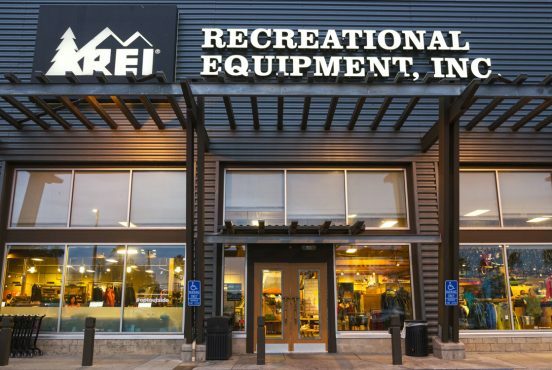 We can’t help you much with the objective factors — that comes down to a careful consideration of how and where you’ll be using your straps — but we’ve got you covered with the rest. Our list of the best hammock straps features the most durable, reliable, and versatile suspension systems on the market. They’re grouped by type to help you understand the basic differences between hammock suspension systems. 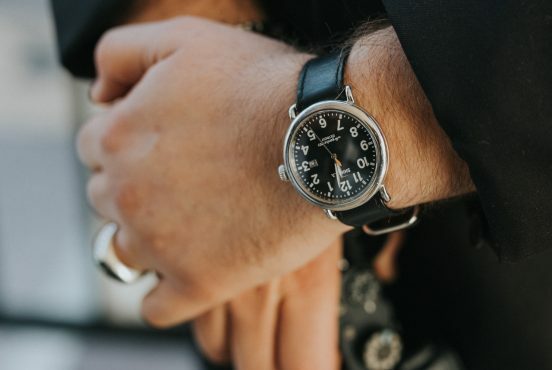 Once you narrow down the type that’s best for you, it should be pretty easy to pick the perfect straps from our shortlist of favorites. Daisy chain suspension systems are the most user-friendly suspension systems. The straps are made with thick webbing material and feature a series of 15 or more sewn loops per strap. 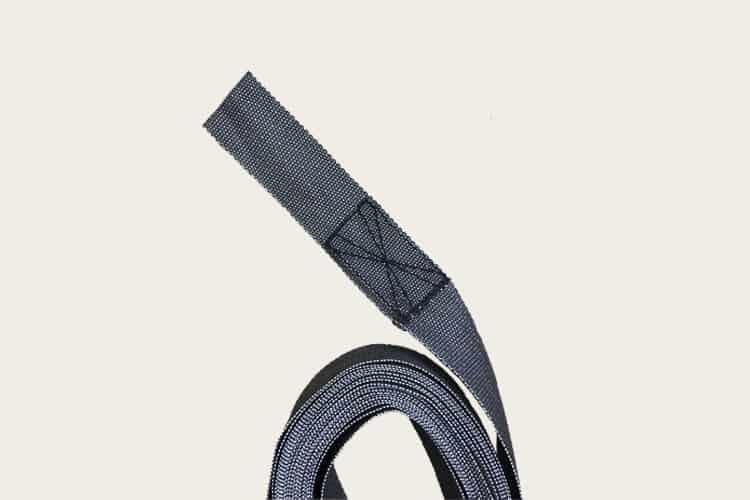 The thick webbing generally supports more weight than other types of hammock straps, and helps protect the bark on the trees you use as anchor points. To set up a hammock using daisy chain straps, all you have to do is wrap the strap around the tree, pull the strap through one of the loops to tighten around the tree, and use a carabiner to connect your hammock to one of the many loops. No complicated knots, buckles, or Chinese finger traps (more on that later). While they’re easy to use and boast a higher weight capacity, daisy chain straps are much heavier than other hammock suspension systems. Weighing anywhere from eight ounces to a pound, these straps are optimal for car campers. You can take them backpacking too, but there are other, more lightweight options out there that’ll shave off some ounces. If you’re gearing up for your first hammock camping trip, a daisy chain suspension system is absolutely the way to go. Many experienced hammock backpackers eventually gravitate to lighter suspension systems, but there are plenty of seasoned campers who still use daisy chain straps. Named for the Greek god Atlas who shouldered the weight of the world, the ENO Atlas Straps can support up to 400 pounds. They weigh just 11 ounces, and they offer 30 combined adjustment points to help you nail the perfect hang angle. At nine-feet long, the Atlas Straps are more than long enough to wrap around larger trees. When greenery is scarce, you can rig these up to a roof rack, boulders, or whatever nature is willing to provide. The Atlas Straps are designed specifically for use with ENO hammocks, but they work with most commercial hammocks. The standard set comes in black, or you can opt for a colorful twist with the Atlas Chroma series. There’s also an Atlas Camo series for campers who like to blend in with the environment. Need a little more length? 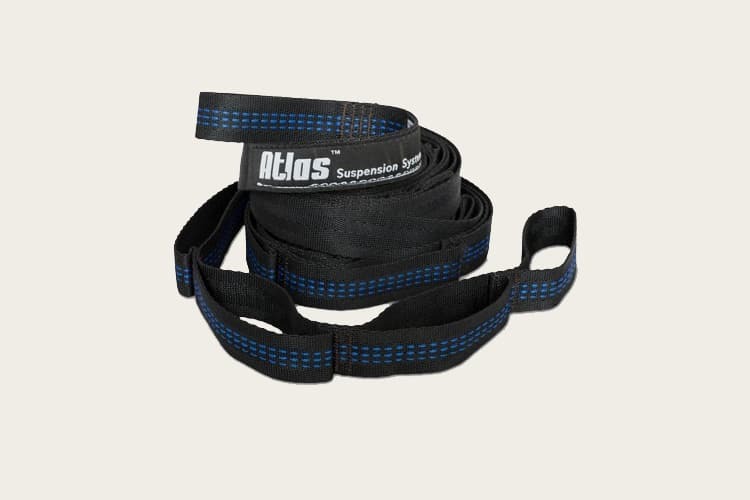 Consider upgrading to the Atlas XL Hammock Straps for an extra 4.5 feet of length. They’re about 5 ounces heavier, but that’s a small price to pay for 13.5-foot straps. The Kammok Python 10 straps are the upgraded version of the popular ENO Atlas straps. Think back to that classic Nike commercial with Mia Hamm and Michael Jordan — “anything you can do, I can do better” — and you’ll get the picture. The Python 10 straps feature Kammok’s patented Nano Weave™ construction that boosts strength while decreasing weight. By pairing the computer-aided Nano Weave™ construction with high-tenacity polyester filament, these straps deliver an industry-leading 500-pound weight capacity. The Python 10 straps also feature Kammok’s patented variable-width technology. The portion that goes around the tree employs a larger 1.5-inch width to protect the tree bark. The straps then narrow to ¾” where they connect to the hammock. This allows the straps to retain width where it matters and cut excess width where it doesn’t, keeping the total weight down and enabling a smaller pack size. To help you achieve the perfect 30º hang, Python straps offer 20 connection points per strap for a total of 40 combined connection points. They rely on flat, high-tenacity polyester webbing to ensure a static no-stretch hang to preserve the optimal hang angle all night. 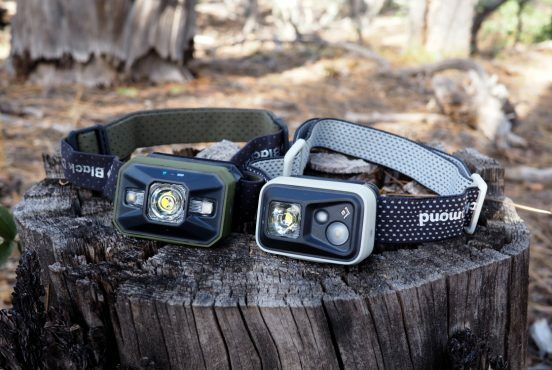 The Python straps also include high-visibility reflective tracers woven into each strap. 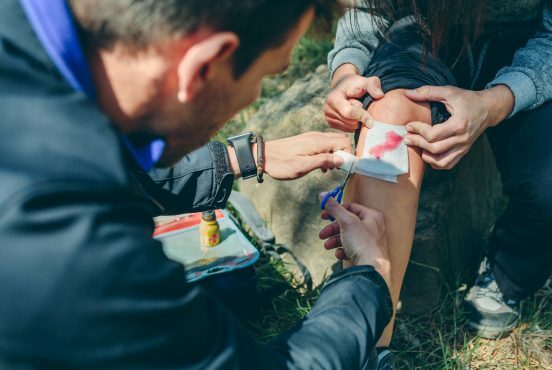 That may not sound like a big deal, but it’s a plus for anyone who’s been clotheslined in the dark while navigating a campsite at night. In addition to the suspension system itself, the Python 10 straps come with a water-resistant, abrasion-resistant Diamond Shell™ stuff sack. 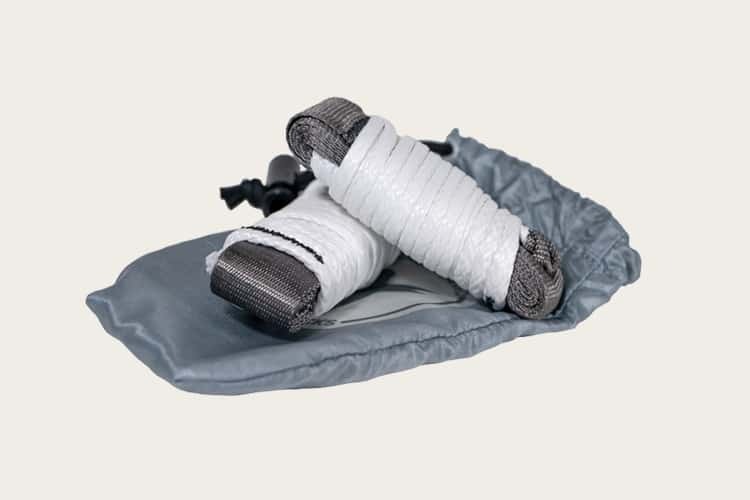 The stuff sack includes button snaps that quickly attach to your hammock’s gear loops or ridgeline, so you can stash important gear off the ground. Looking for longer straps? Upgrade to the Python 15 suspension system for a set of 15-foot straps that weigh less than 12 ounces. Hammock hangers on a budget will love the HangTight Straps from Nature’s Hangout. This small, family-owned business produces reliable hammock products that don’t break the bank. 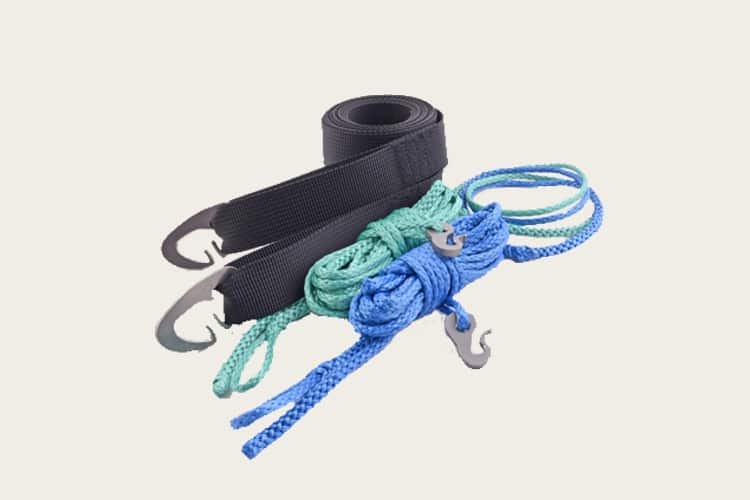 The HangTight Straps employ a basic daisy chain loop system that makes it easy to customize the hammock height and achieve a comfortable position. There are 16 loops per strap, for a combined 32 connection points. You can pitch a hammock in less than two minutes with these straps, and there’s no need to learn any complicated knots. The straps are constructed with no-stretch polyester webbing and reinforced stitching for extra safety. The aluminum wiregate carabiners are lightweight and don’t have any sharp edges, so you don’t have to worry about snagging your hammock during setup or takedown. The HangTight Straps boast a maximum strength rating of 700 pounds, though the tags on the straps clearly indicate a maximum capacity of 500 pounds (250 per strap). Whoopie slings are the go-to suspension system for backpackers because they’re significantly lighter than daisy chain straps. Where the lightest daisy chain straps are in the ballpark of eight ounces, most whoopie sling suspensions are half that weight. Whoopie slings employ the same mechanical concept as the ancient Chinese finger trap. It’s a strange concept at first glance, but watch a video of someone hanging their hammock with a whoopie sling and you’ll see just how easy and effective they are. You can make all the adjustments you want with the pull of a string, then the system instantly locks up when you apply some weight. Whoopie slings make it easier to achieve the perfect hang angle because you’re not restricted by the loop placement in daisy chain straps, but there’s also a greater chance of slippage. 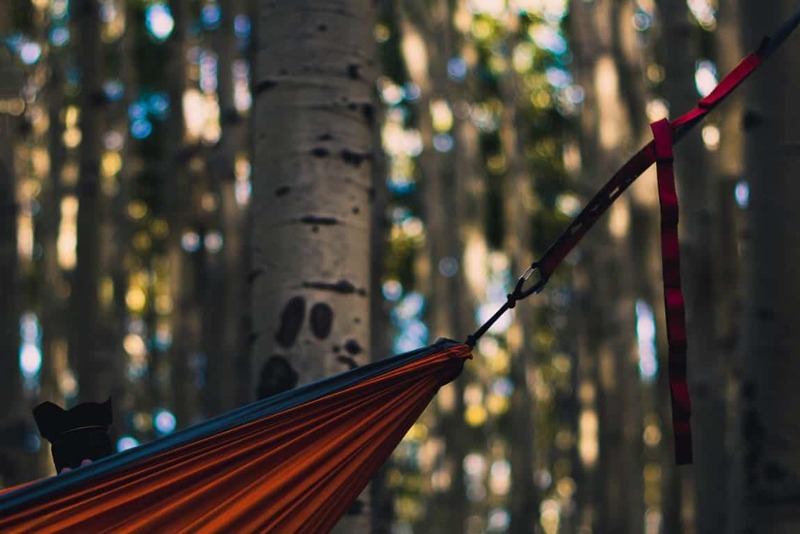 They’re fairly simple and easy to use once you get the hang of it, but they require a basic understanding of hammock hanging that only comes with experience. Fans of the ENO brand looking for a lighter suspension system will love the Helios Ultralight Suspension System. ENO’s lightest suspension system, the Helios straps weigh in at just 5.7 ounces — almost 50% lighter than the popular ENO Atlas straps. The Helios straps are built with Dyneema cord that’s lightweight and ounce-for-ounce stronger than steel. The tree slings employ a high-tenacity polyfilament webbing that protects the tree bark while ensuring a snug fit that won’t slip. The webbing also makes the straps incredibly versatile, letting you attach the straps to just about any solid anchor point. Setting up the Helios suspension system is a breeze thanks to the Microtune™ bury splice tension system. The system makes adjustments nice and easy, and there’s no need for any knots. The Helios straps come with a silnylon stuff sack for tidy storage and easy transportation. 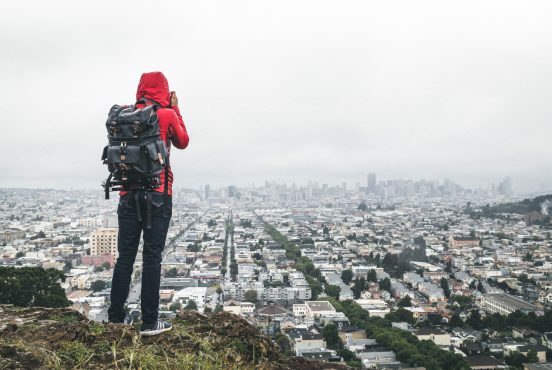 The straps can hold up to 300 pounds, more than enough to support the average backpacker. If you’re looking for longer straps, check out the Helios XL Ultralight Suspension System. The XL package delivers 13.5-foot straps that are almost 70% longer than the standard Helios series, and they only weigh an extra ounce. If you’re looking for an ultralight whoopie sling, check out the Hummingbird Hammocks Tree Straps. These ultralight straps pack down to the size of a candy bar, and they weigh only 1.6 ounces. 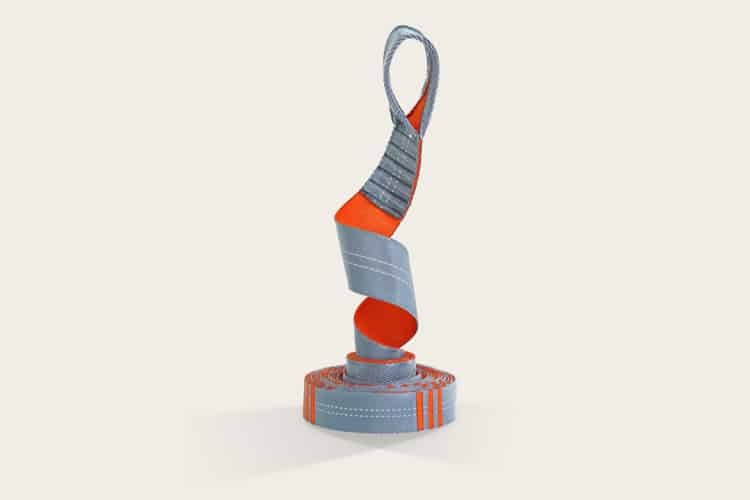 Hummingbird Hammocks is all about applying parachute tech to create ultralight hammock gear, so the Tree Straps use Size E bonded nylon thread (the industry standard for parachutes). The straps are sewn using ball-point needles that gently guide webbing fibers out of the way of the thread rather than piercing or tearing, which preserves the fabric’s natural strength. Understanding that thin straps can damage tree bark, the Hummingbird Hammock Tree Straps spread the load across a larger surface area with one-inch Dyneema webbing. The webbing is incredibly strong yet surprisingly light, so you’re not wasting any weight. Looking for longer straps? Upgrade to the Hummingbird Hammock Tree Straps+ for an extra five feet of length per strap. You can also grab some Tree Strap Extensions to give yourself an extra 12 feet of 1500 lb Spectra Cord. DutchWare offers an insane amount of options when it comes to hammock suspension systems, from custom DIY pieces to packaged kits. They’re an excellent resource for picky hammock hangers who know exactly what they want, and all of their products are handcrafted here in the USA. The DutchWare Whoopie Hook Complete Suspension package comes with everything you need to hang your hammock, including two titanium whoopie hooks, two six-foot whoopie slings, and 8” continuous loops. You can opt to add sewn-in Dutch Clips and tree huggers that extend your range. The neat part about these straps is how they replace the traditional whoopie bead with a titanium hook that “snaps” onto the continuous loops. 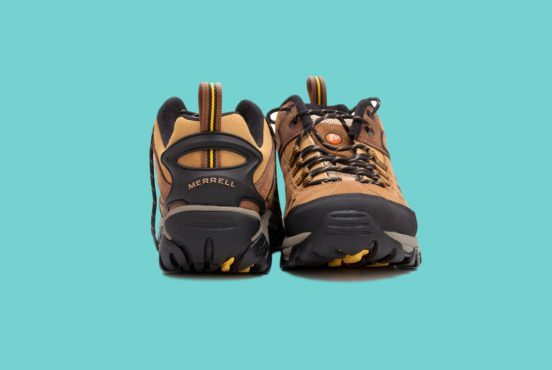 They’re easy to connect and disconnect, but they’ll remain locked in tight until you’re ready to pack up and hit the trail. Buckle suspension systems strike the balance between whoopie slings and daisy chains. Buckle suspensions use a buckle to make adjustments and lock in your hang angle, so they weigh a little more than whoopie slings. Buckle suspensions are more user-friendly than whoopie slings, and they do a better job at protecting against slippage. 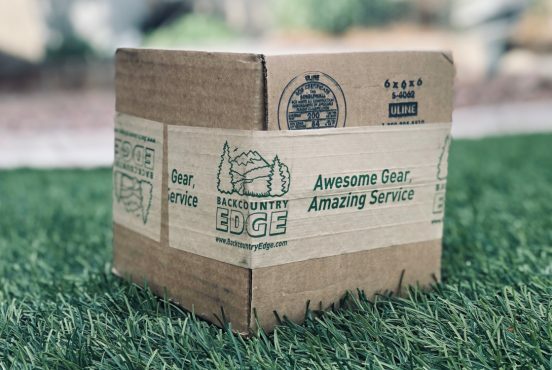 They’re a great choice for backpackers with a few successful hammock hangs under their belt who are ready to upgrade from their daisy chain straps. The downside to buckle suspensions is that they’re usually a little heavier than whoopie slings. You can opt for lightweight titanium hardware for an optimal strength-to-weight ratio, but the fact that you’re adding hardware that whoopie slings don’t require means you’ll always come in higher. Cinch buckles are one of the simplest way to hang a hammock, and they’re proven to hold up under pressure in any weather conditions. 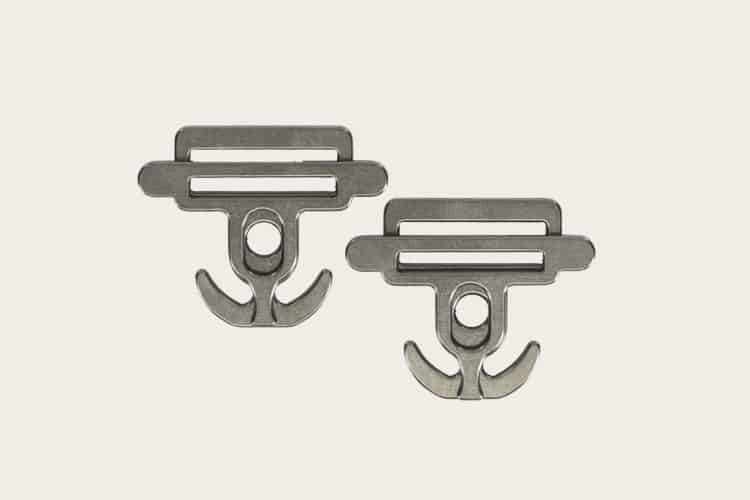 If you decide to go that route for your hammock suspension system, check out the Titanium Cinch Buckle Complete System from DutchWare. This kit combines DutchWare’s Dutch Clips, Tree Straps, Titanium Cinch Buckle, and 8” Continuous Loops. 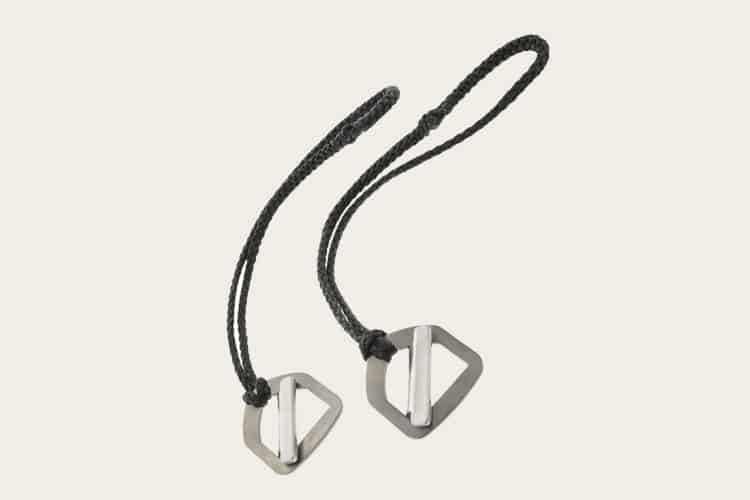 The titanium buckles have an aluminum slider, and as long as the rope is in place the slider can’t fall out. The buckles also feature a center notch in the back to prevent the buckle from twisting. When you’re ready to hang your hammock, the straps attach to the hammock with 7/64 Amsteel continuous loops. Simply wrap the one-inch-webbing tree straps around the tree, fasten with your Dutch Clip, and pull the strap to get the right amount of sag. There’s no need for a backup knot. The Beetle Buckle Complete Suspension is the newest suspension system from DutchWare. This patent-pending suspension system was specifically engineered for the DutchWare Chameleon hammock, but it works with most third-party hammocks. Built to excel where other suspension systems fall short, the Beetle Buckles are made with grade 5 titanium that’s strong, light, and anti-corrosive. The buckles are remarkably easy to use, featuring special wings that make it easy to release and adjust the tension with a simple squeeze. The Beetle Buckle Complete Suspension is primarily a solo suspension system, but you can use it to support two hammocks when used with a spreader bar. DutchWare’s spread bar adds a few ounces, but it’s worth it to save weight by sharing a tarp and suspension system. It’s a nice option for couples who normally have to sleep separately when hammock camping. Like all DutchWare products there are more customization options than we can list. One that we will mention is the ability to choose between polyester straps and spider/poly straps. The former offers a higher weight capacity of 300 pounds, while the latter sheds a few ounces in exchange for a lower capacity of 250 pounds. Daisy chains, whoopie slings, and buckles are great, but those are all recent improvements to the modern hammock. At the end of the day, all you really need to suspend your hammock is some rope and a good knot. Of course, you can still honor the old school ways with a modern upgrade. 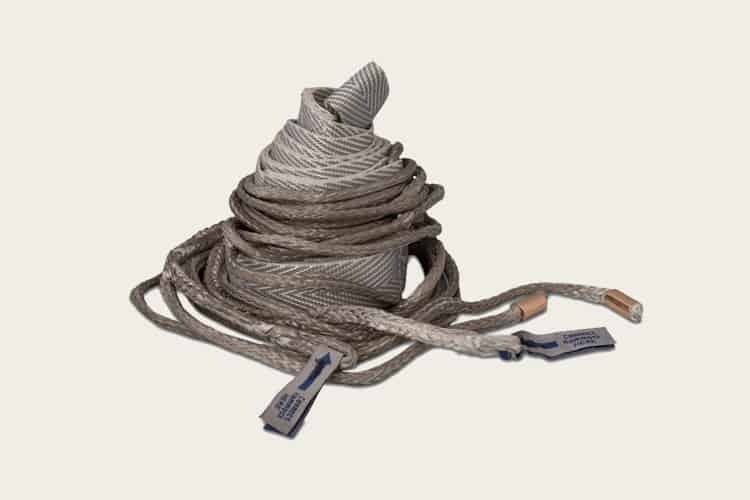 Specialty cords like Dyneema, Spectra, and Amsteel are significantly stronger than rope and are often lighter. Even better, try using a thick webbing material that won’t dig into the tree bark and damage your anchor trees. The greatest advantage of using a knot-based suspension system is how light and compact they are. It’s hard to beat a pair of straps that weighs two ounces and packs smaller than your fist. The downside to knot-based suspensions is fiddling with knots. Unless you’re an Eagle Scout, it’ll take plenty of practice to start tying reliable knots. Rope and cord are prone to slippage, so you’ll often need to tie a backup knot to ensure you don’t end up on the ground. Generally speaking, knot-based suspensions are exclusively for seasoned hammock hangers who want the lightest possible setup. Many whoopie slings are just as light, so you’ll have to seriously evaluate if it’s worth the added risk and hassle to shave off a fraction of an ounce. South American natives have been sleeping in hammocks for thousands of years, so it’s worth paying attention to the types of straps they use. You won’t find many daisy chains or whoopie slings down there. Instead, they keep things simple with a Becket Hitch. Boy Scouts might recognize the Becket Hitch as the Sheet Bend, though there’s a minor difference. While the Sheet Bend takes a bend or loop created in the fabric, a Becket Hitch uses a fixed eye loop. 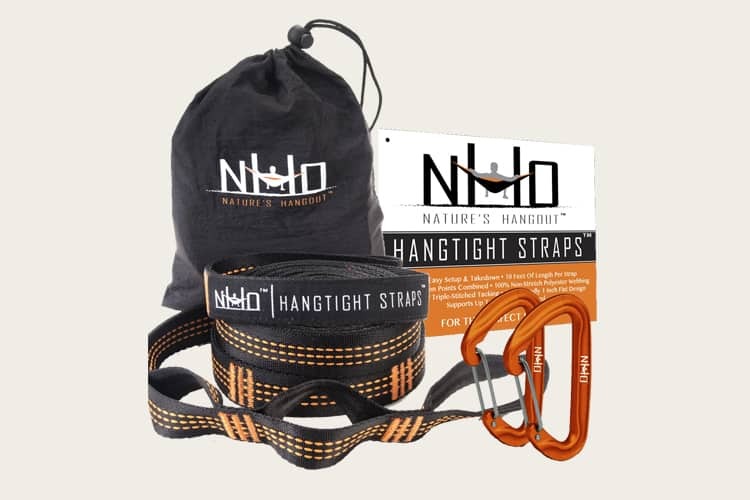 The trick with using a Becket Hitch to hang your hammock is to use the right material, and the Warbonnet Outdoors Becket Straps ensure you have the perfect material at your disposal. Where cords like Dyneema, Spectra, and Amsteel are prone to slippage, the Becket Straps use one-inch dynaweave webbing that locks in place all night. Setting up your hammock with Becket Straps couldn’t be easier. All you have to do wrap the strap around the tree, slip the end through the continuous loop at the end of the hammock, tie a Becket Hitch, and you’re done. When you’re ready to leave, just pull on the tail to break the knot. The best part about using the Becket Straps is how unbelievably light they are. There’s no hardware required, so it’s just the straps. Weighing in at just 2.2 ounces, you’ll be hard-pressed to find a 15-foot hammock suspension system that’s lighter than this. What Else Do You Need To Go Hammock Camping? 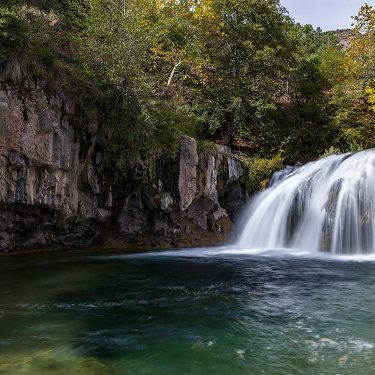 Get your hammock camping setup together and hit the trail.